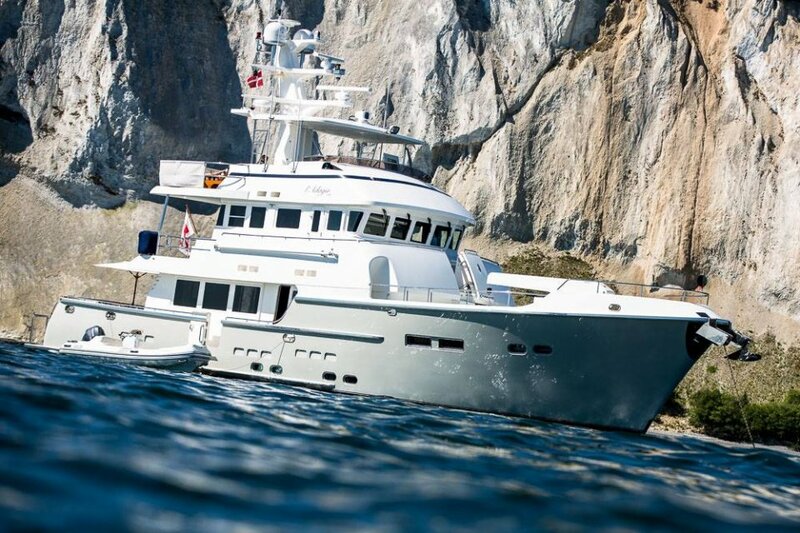 L’Adagio is a fantastic expedition trawler. 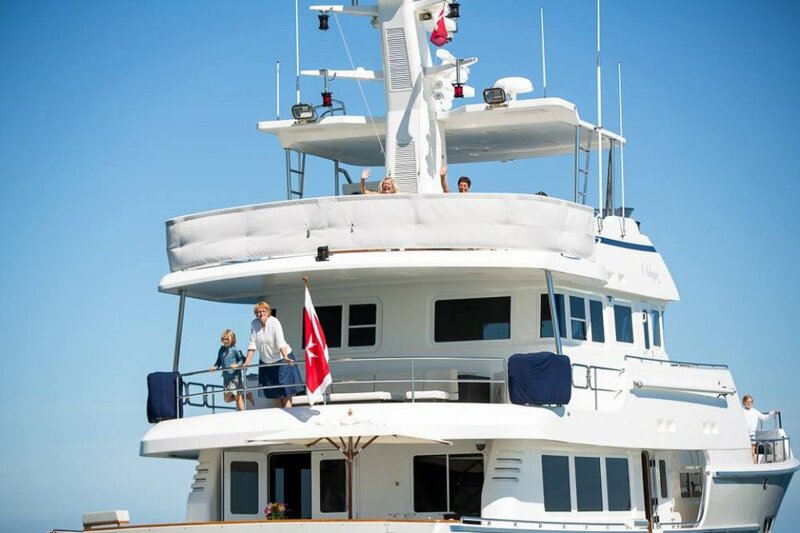 She has served as a perfect luxury yacht. No compromises have been made in her production, maintenance or further equipment. She has been equipped to go to the end of the world and back. Over the years her already excellent machinery and systems have been improved to ensure comfort, range, and safety. L’Adagio has travelled far and wide, including Alaska, USA, Mexico, Central America, The Caribbean, Bahamas, US East Coast and Canada. 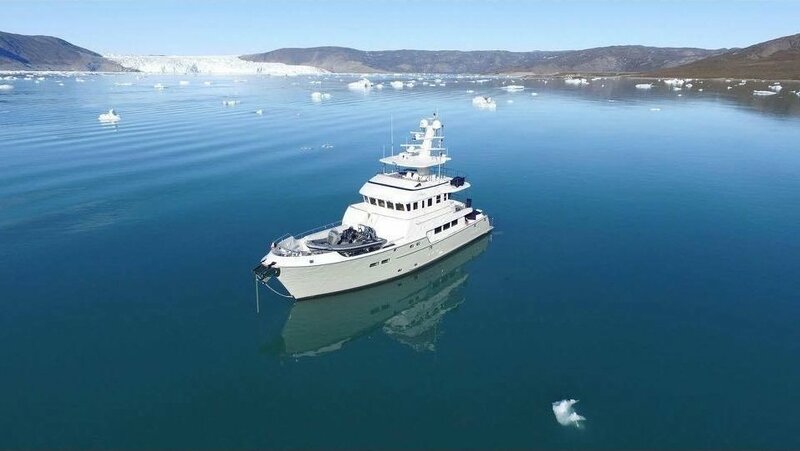 she has seen the ice-covered fjords of Northern Greenland and into Europe. 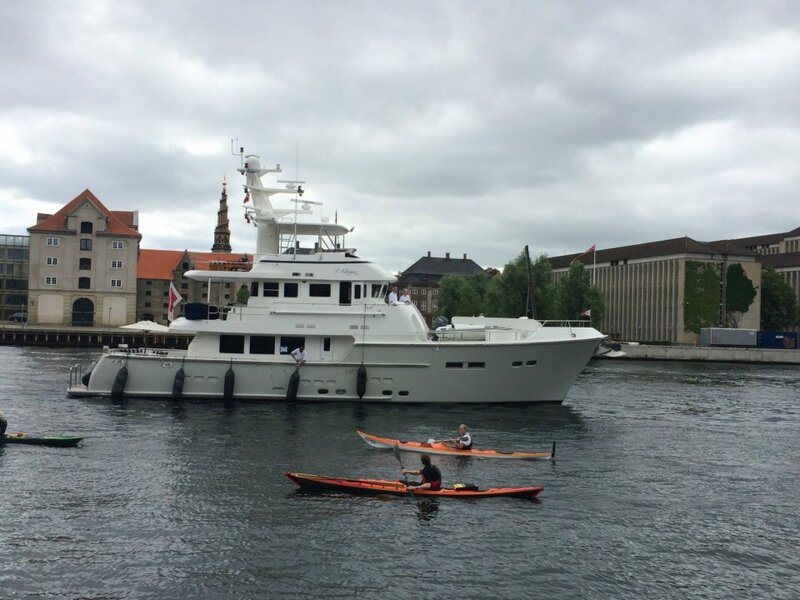 This beautiful boat really is capable of taking you around the world! 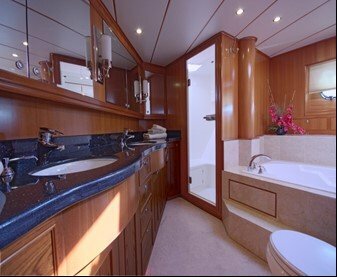 She is a very sophisticated vessel and beams luxury throughout her interior. 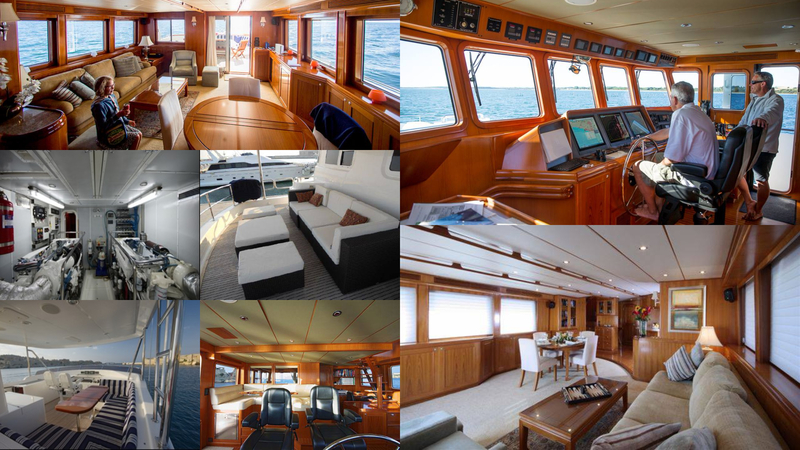 With beautiful teak floors and woodwork, you can cruise in a classical Nordhavn style. She is big, safe, comfortable and comes fully serviced in pristine condition with all systems ready to take you wherever you care to cruise. 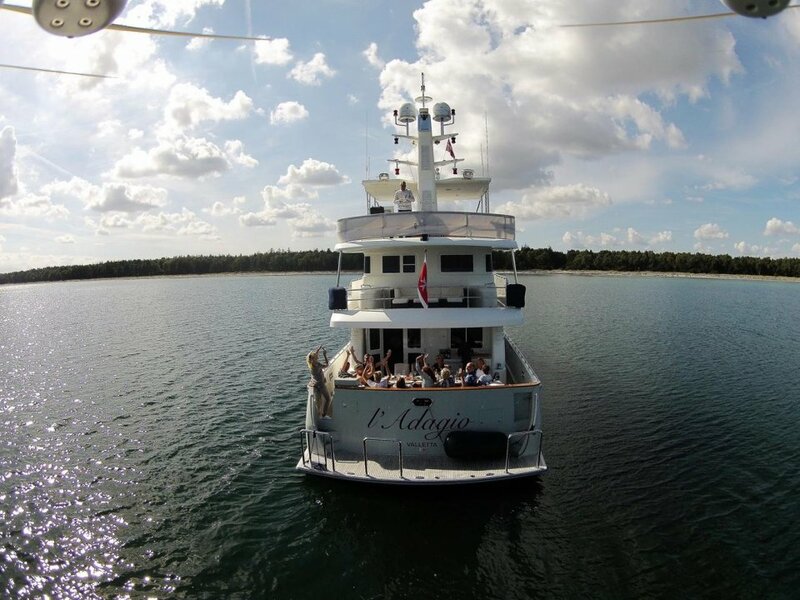 L’Adagio is an outstanding vessel and has served her current owner extremely well. 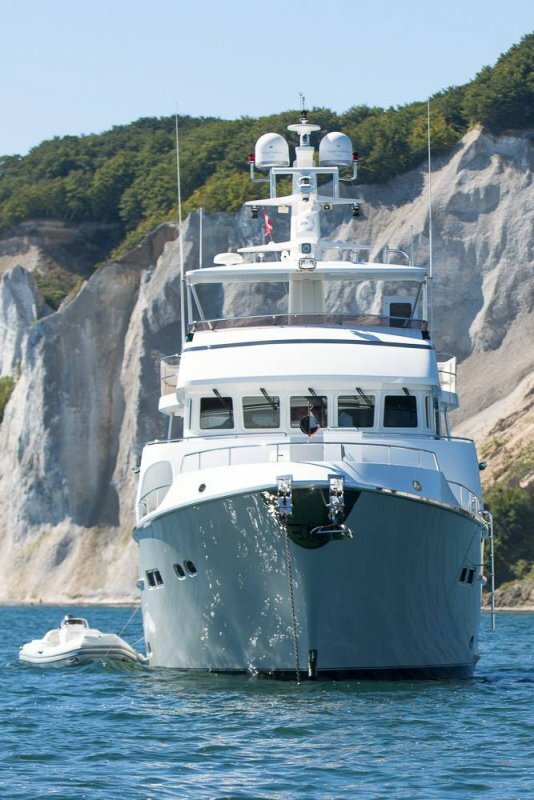 She is a beautiful example of the Nordhavn 76 and is ready to take you on your next adventure! 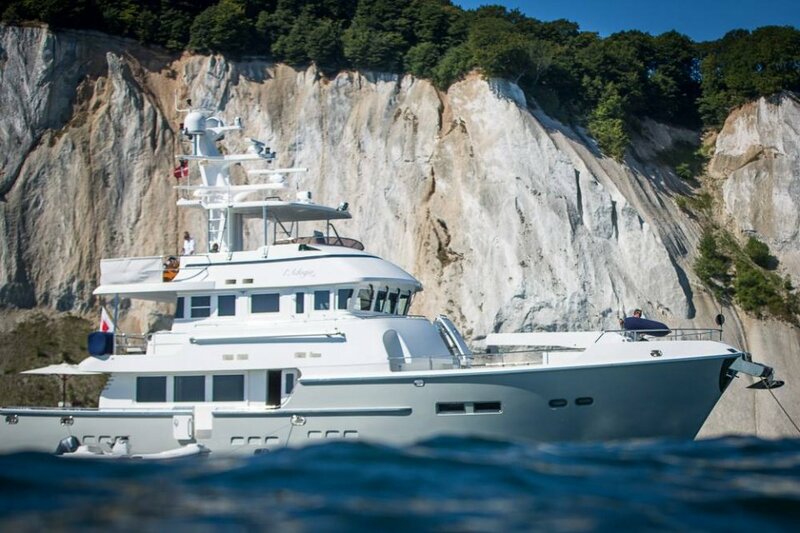 If you are interested in the Nordhavn 76, she is the one! PRICE: $3,500,000 VAT fully paid. Forward of the dining table on the portside is plenty of shelving for books and a display cabinet for glasses etc. To port is a large 46” LED TV on a lift system which can be comfortably watched from the starboard sofa or stand-alone armchairs. 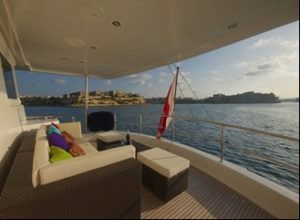 On the starboard aft corner of the saloon is a cabinet housing the custom Sonos controlled Yamaha digital surround sound music and B&W entertainment system supplying different entertainment around the boat. The larger windows in the saloon have custom Hunter Douglas blinds, known as Silolite blinds. All doors hatches and openings are equipped with bug screens. The saloon is fully air-conditioned, as is the whole boat. Heating is provided by the central AC system which is also equipped with electrical heaters in every air handler. The main Electrical control panel is located between the saloon and galley in a small lobby with door to starboard. Very well-appointed Galley with Miele electric oven and hob with Miele extractor over, further Miele microwave and oven, Miele full-size dishwasher, “Sub Zero” large fridge with 2 fridge drawers below and 2 further freezer drawers with ice maker. All “Sub Zero” units have teak facing. Trash compactor. Double sink with mixer taps, in sink Food Waste Disposer, UV sterilized, carbon filtered drinking water tap, soap dispenser, Breville Espresso machine and Vitamix Blender. 240V 50Hz and 120V 60 Hz outlets. On the left, upon entering the galley there is a large walk-in pantry with shelving, ideal for storage. Cupboards equipped with sea safe holders for porcelain and glassware. Sink with mixer taps, soap dispenser and mirror fronted cabinets above. Opening port lights to port. Tecma head. 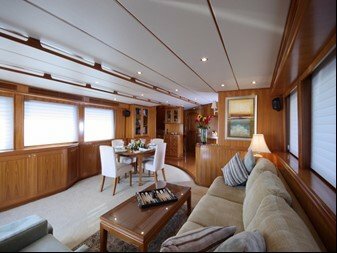 Light and spacious cabin with larger opening rectangular port lights to both port and starboard, fitted with the custom two style blinds for the night and privacy day blind. 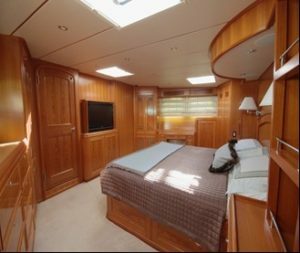 King sized bed with custom Tempur mattress, vanity unit to starboard and opposite the bed against the forward bulkhead is a TV lift with 32” Plasma TV. The cabin is carpeted throughout. Numerous cupboards, drawers and hanging lockers. Double sink with mixer taps. Mirror fronted cabinets above and storage cabinet below the sink. Large bath with mixer taps and Jacuzzi. Separate large walk-in shower with seating and storage cupboard. Tecma head. Access from staircase portside between galley and saloon. Carpeted and the location of the wine storage. Capable to store 100 bottles with a thermostatically controlled cooler. Separate storage cupboards and drawers. Queen sized bed with custom mattress, hanging lockers, vanity desk and mirror above. Queen sized bed with custom mattress, hanging lockers and extra pull out bunk. Wall mounted TV and own en-suite head with Vaccu-flush head, sink with shower unit. Marble floor and granite tops with oval sink, mixer taps with mirror fronted cupboard above and drawers below. Vacuflush head, walk-in shower. Currently being used as a utility room with Miele washer and dryer, Sub Zero below counter fridge/freezer, microwave, sink with mixer taps, granite tops, storage cabinets above. To turn this area into a crew cabin could be achieved with minimal work. 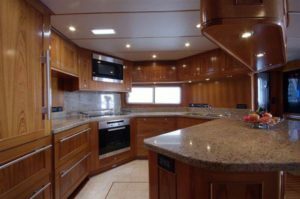 Located just forward of the engine room, fully fitted with stainless steel worktops and vice. Cabinets above for storing fittings, a large inventory of spare parts, associated equipment and all relevant manuals for the engine room. Below is a Snap-on tools box with every conceivable tool. 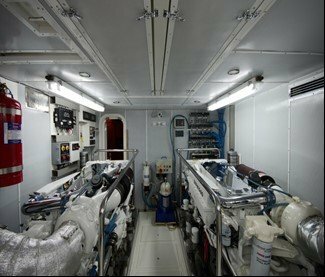 Located behind a watertight door, the engine room as with the rest of the boat is well laid out enabling the owner to operate, maintain and move about the engine room with ease. Each engine is equipped with a separate Puradyn bypass oil filtration system. Large 200 Amp alternators on both engines, each capable of running the boat when cruising. Hydraulic PTO on each engine. The hydraulics can be operated on single engine runs. Hydraulic high-pressure filter fitted to ensure flawless hydraulic operation. PSS “drip-less” shaft seals give a dry bilge boat, shut off valves allow cruising on a single engine. Fuel manifold and transfer system, waste oil disposal system permanent to engines and gens. 25KVA Atlas power conversions system. 3 x 50Hz inverter/chargers allowing inverting/charging of 9KW and 1 x 60 Hz allowing 2.5KW inverting. Main Electrical distribution Panel with an Ample Power Smart Alternator Regulator V3. 2 Mastervolt Mass Battery Chargers (24/100 and 24/60) paralleled and controllable to allow dockside input of 8-32 Amp – 240V 50Hz or 120V 60Hz. Fishing kit including several rods and reels and plenty of lures etc. Air conditioning system chilled/heated water with 3 compressors. 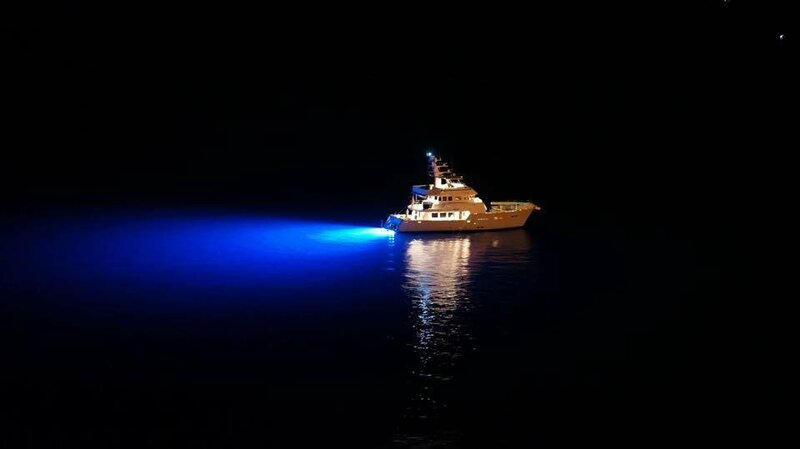 Underwater light system – Lumishore LED with color change fish attraction function. Approached via a stairwell from the saloon, the Pilothouse is a light open space with great 360-degree visibility with two Stidd helm chairs face the well laid out ships navigational instruments and central control station. Comfortable seating behind the helm chairs with teak table. A very comprehensive instrument package with all the major systems being duplicated for safety. A “Captains” fridge ensures comforts on transit. There are three independent navigation systems onboard, 2 PC based MaxSea/TimeZero-Pro systems capable of being run in parallel or individually. Each controlling radars, sounders and charting system etc. and a standalone Furuno system with its own Radar, sounder and charting system. 1 x 18” Furuno standalone system. 2 x Furuno PCs each a high power unit with i7 processor SSD disks etc. 1 x Furuno sun-light screen on flybridge. 2 x Radars – both open array. 4 x Axis surveillance cameras integrated into the MaxSea system and with individual controls. FLIR Thermal night vision camera can be operated from within the MaxSea system or on its own system. Flir can be locked to objects, MOB or positions. The Flir is awesome to navigate in icy waters. 2 x Simrad 25 autopilots, fully independent systems which can be operated from PC or Furuno. Control for the hydraulic TRAC stabilizers. Many more of the control panels for systems around the boat are located in the pilothouse including the 12 and 24-volt panel. 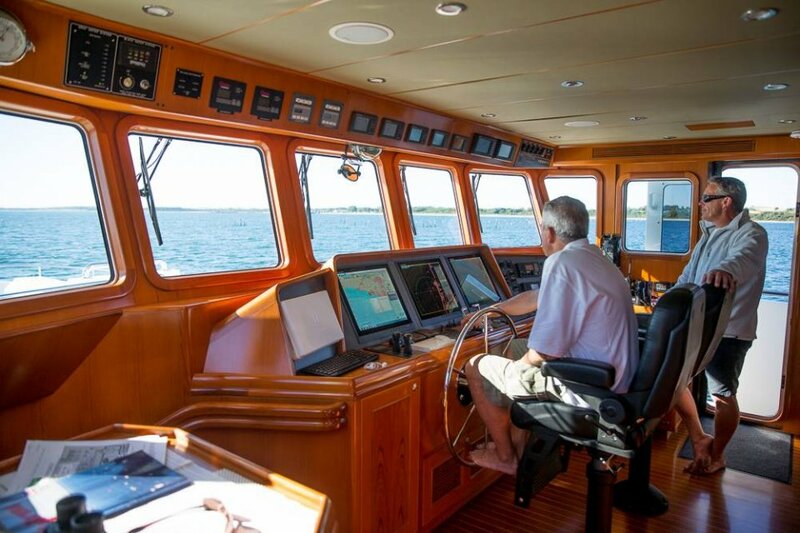 In the pilothouse there is also a good office with shelves, drawers, an office desk with a wall-mounted computer screen serving the central ships computer/entertainment server. This is also the center of L’Adagio’s comprehensive IT network. Cisco routers and switches as well as a Pepwave Max HD2 as the main provider of the Internet via Satellite, Wifi from shore, 3G, 4G, cable, or teetering. Captains / separate guest cabin. Single or double bed, ensuite bathroom and head with separate walk-in shower. Plenty of hanging locker and drawer space. The cabin is currently being used as a relaxing area with sofa which pulls out into a double bed. Larger teak covered swim platform with a folding cleat, deployable swim ladder and three large stainless steel safety guards (staples). Shorepower inlets and Glendenning shore power retrieval locker, larger central hawse pipe. Stairs both port and starboard to large cockpit. Teak covered cockpit with two access hatched to the Lazerette, Varnished teak cap rail to the transom, built in seating with removable teak expanding table and further teak seating. All seating is covered with attractive blue and white fabric. The cockpit has dining capability for 10. 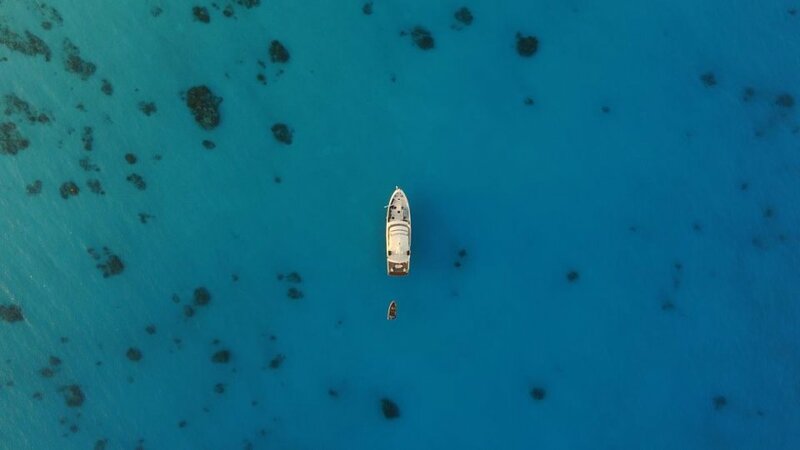 To the starboard side is one of six control stations enabling easy and excellent visibility for alongside docking and or Mediterranean mooring. Large electric BBQ with work surface and cupboards under, granite chopping block and sink with mixer taps. Electric windlasses each side with foot switches used for warping work. Locker with compressed air nozzle, fresh water and salt water tapes. Walkway to port has boarding door and leads to large storage cupboard, ideal for wet suits etc. Walkway to starboard side has boarding door and single door access to the inner lobby by the main electrical control board. The walkway continues to the foredeck via 6 steps. Foredeck with large tender: 6M long-range Ribeye tender with 115 Hp Yamaha (150 hours), 5 Hp (10 hours) Yamaha wing engine, Kevlar keel protector, Raymarine navigation, VHF, AIS (class B), swim ladder, mounted to port with removable mounts and a further small tender, deck mounted to port. Large Marquip davit 2500 lbs /ext. telescopic system – allows launch off either the port or starboard side. A fiberglass storage box is located under the boom of the davit for storage and also supplies compressed air spigot and fresh water and sea water taps. Large deck lockers port and starboard. Port and starboard chain lockers for the twin Maxwell 4500 hydraulic windlasses with two 135 kg anchors Windlasses controllable from the foredeck, pilothouse and flybridge. 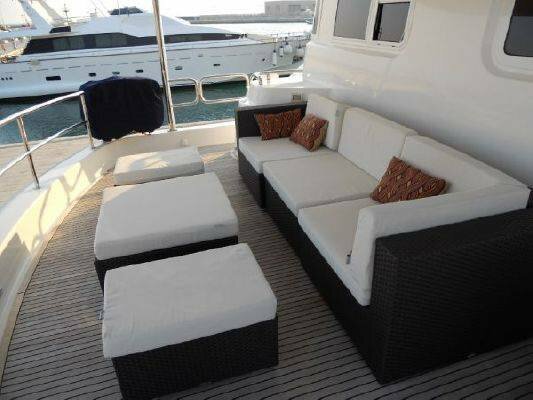 The area behind the pilothouse opens to a lovely upper aft deck which is completely covered by the flybridge aft deck with attractive custom sofa and seating with low-level table. Located on this deck in each aft corner are two Switlik 6 man life rafts (full Solas compliant). Port and starboard side are ‘flopper stopper’ poles with associated rigs. Access by the stairs from the Pilothouse. 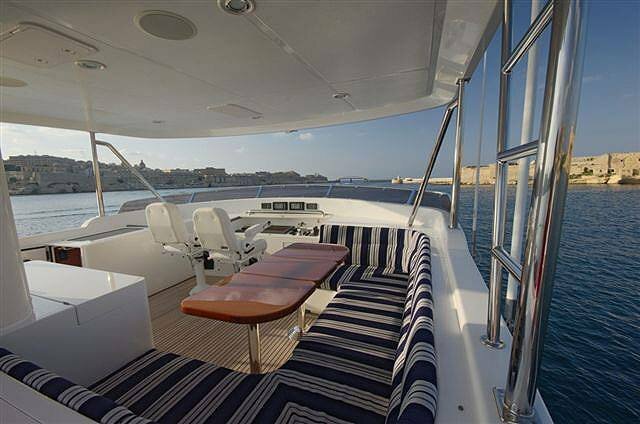 Protected from the sun by a fiberglass hardtop, the flybridge is the second control center for the boat with 360-degree visibility from the two Stidd helm chairs with many of the main instruments and control systems repeated from the Pilothouse to the well laid out panels on the flybridge. 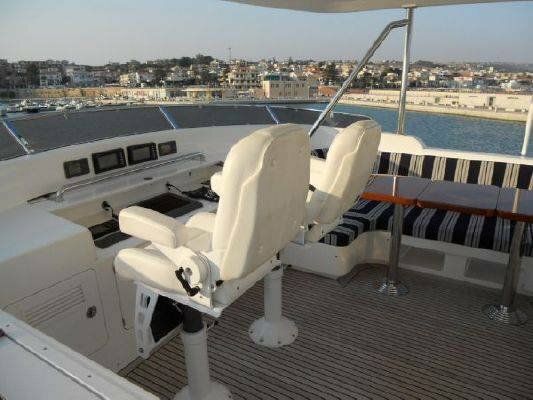 Behind the helm chairs, offset to starboard is further seating with teak topped dining table, BBQ/grill with cooktop, sink, and fridge. Behind the stack system is a continuation of the flybridge deck which is open, equipped with teak sun loungers and a further area to relax and enjoy the sunsets! Visit Laust Sondergaard’s Youtube channel to see lifestyle videos of L’Adagio.